Every week seems to bring another round of tariff woes. This week the combination of new tariff threats and month/quarter end portfolio restructuring caused a massive decline in the tech sector as well as the already beaten down industrials. The Dow rebounded 166 points from its intraday low of -494 but still posted a very ugly 328 point loss. The Nasdaq rebounded 55 points from its 216 point intraday drop but still closed with a -2.1% loss. 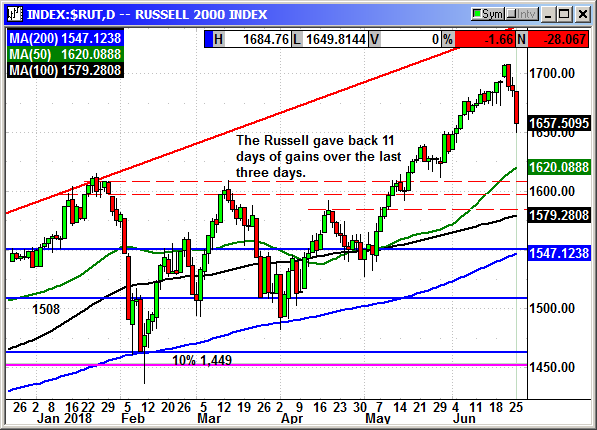 The Russell 2000, which had been the strongest performer gave back 28 points for a -1.6% loss. 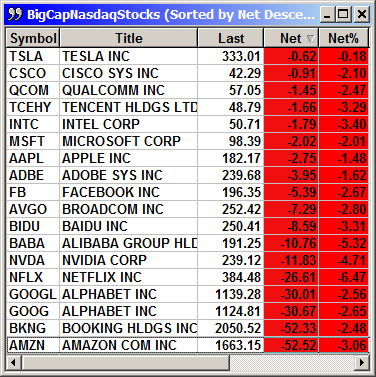 FANG stocks were especially hard hit since they had been outperformers in May/June. Portfolio managers had built up significant profits and the elected to trim those positions ahead of the summer doldrums when low volume would make the market even more susceptible to high volatility. The end of the second quarter tends to see some profit taking as managers take a late "sell in May and go away" position with hopes of buying the dips in August/September. 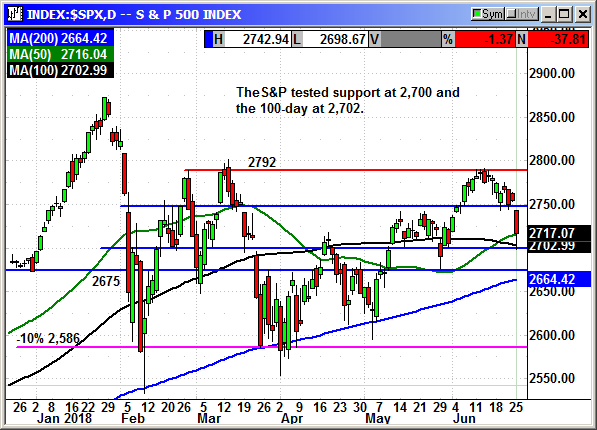 The S&P tested strong support at 2,700 and the 100-day average at 2,702 and rebounded slightly. This would be a perfect spot to stage a goal line stand and fight off the sellers. Easy to see support points typically attract the most buyers. However, we are likely to see more pain before the tariff battle is over. We have not reached the max pain point yet in the negotiations. This suggests the S&P will test those levels again and possibly even the 200-day at 2,664. The Dow dipped well below the 200-day but rebounded to close only about 28 points below that average. The Dow is not normally reactive to moving averages but the 200-day is significant. That average held on both the April and May dips. 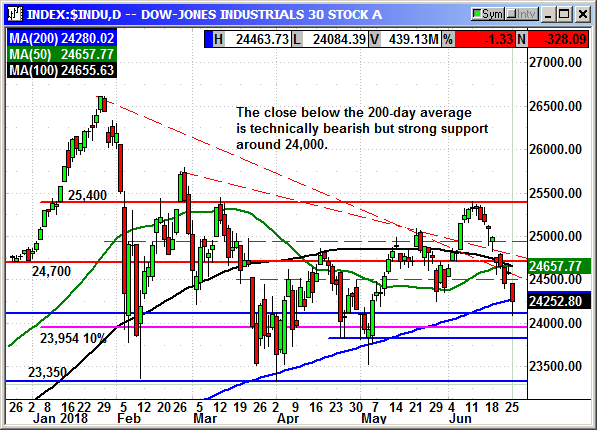 There is also strong support at the 10% correction level of 23,954 and prior support at 23,850. The key here is not specifically Dow support but tariff headlines. If the headlines fade or it appears negotiations are proceeding towards a conclusion, the market will rally. 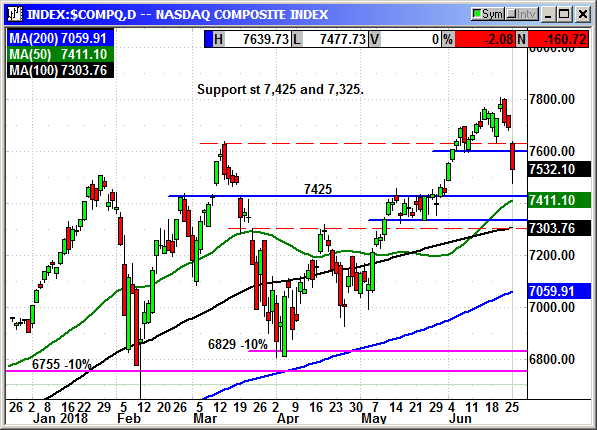 The Nasdaq has decent support at 7,425 and 7,325 and those should provide a stopping point on any continued decline. Much of the selling is simply portfolio restructuring at the end of the quarter and once that is over, new buyers will appear. I would buy the dip to 7,425 on the Nasdaq. The Russell had the most accumulated profit and was very overbought. It is no surprise that the index took a serious tumble. However, it remains the strongest index and the most likely to rebound as long as tariffs are a risk. 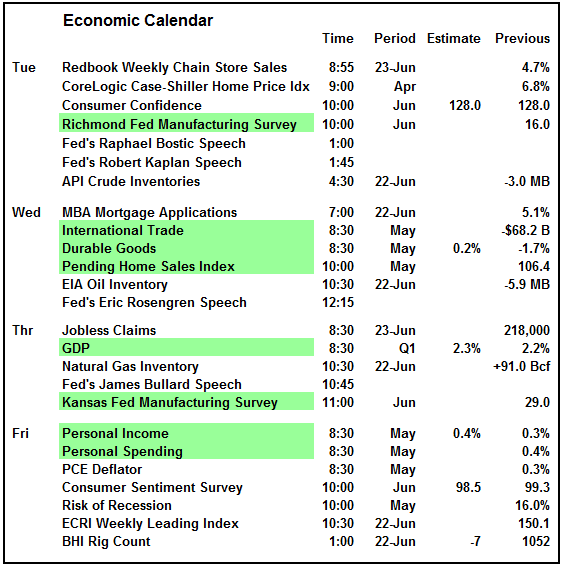 The economic calendar is not a threat to the market. 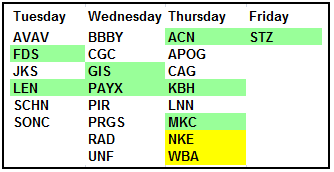 There are no market moving reports this week. This is just good solid economics that will confirm the economy is doing well and continuing to grow. 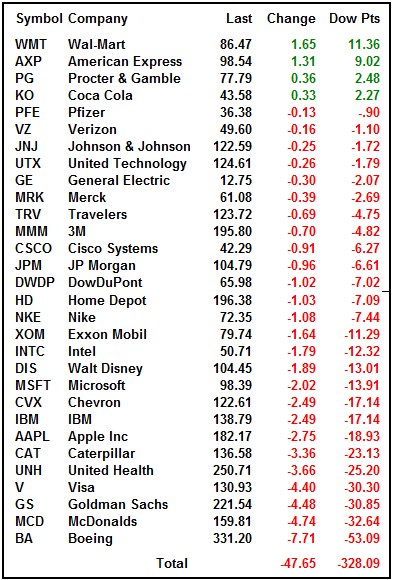 There is nothing material on the earnings calendar until Thursday when two Dow components report. The S&P futures have rebounded from -4.50 to +3.00 in the overnight session but there is still a lot of darkness before the dawn. 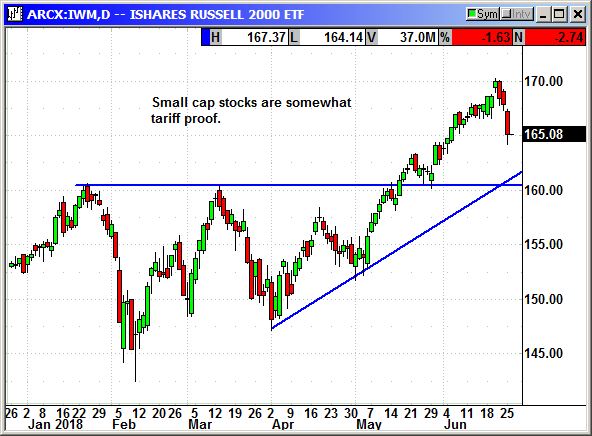 I would hesitate to recommend buying this dip but i did add a potential index rebound play with the Russell ETF. If we do not get a rebound, it will be a loser. 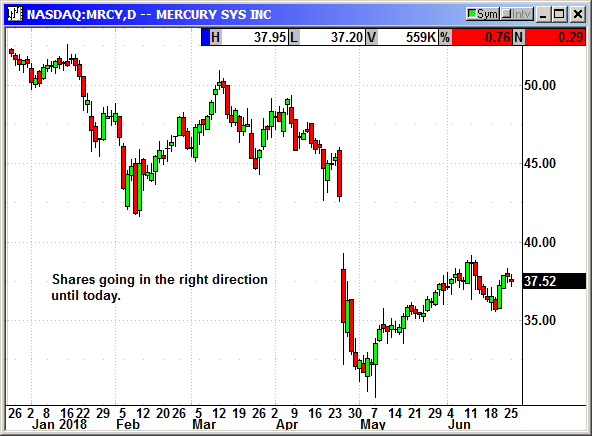 However, the market is typically positive going into the July 4th holiday. If the president can restrain from tweeting tariff threats until after the holidays, the market may calm and investors will begin to return. Until the tariff issue is solved, there will always be risk for a lower low. Be prepared for turbulence. Buy Sept $168 call, currently $3.85, stop loss $159.85. Optional: sell short Sept $155 put, currently $2.44, stop loss $159.85. The long call position was stopped at $140.65. The long call position was stopped at $53.85. 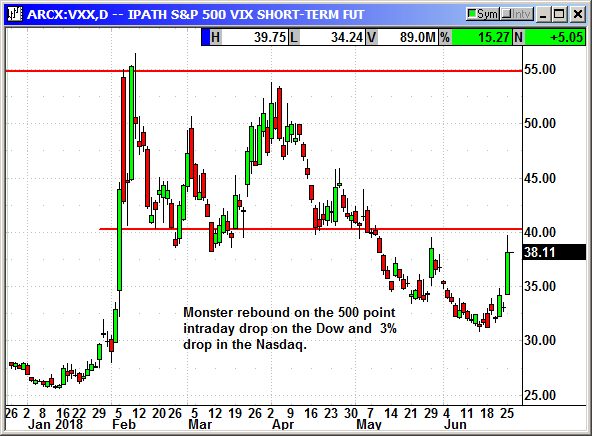 The June long call position was stopped at $20.25. No specific news. 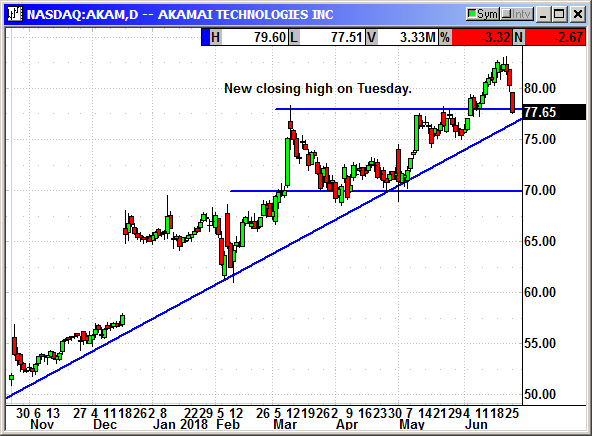 Shares closed at a new high on Tuesday then declined with the Nasdaq the last three days. 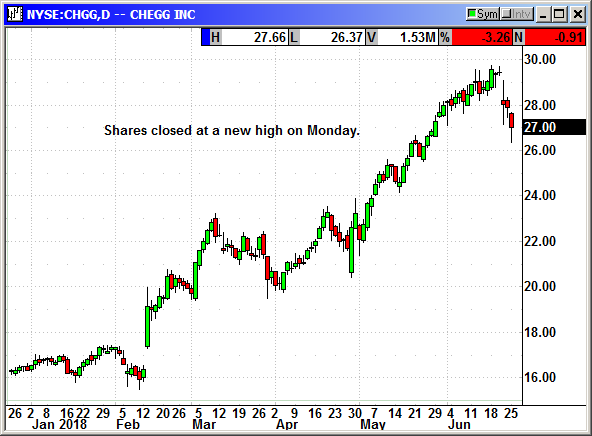 Chegg fell on Thursday after Jefferies downgraded the stock from buy to hold. With the stock up 500% in two years and valued at 9x sales. Shares fell again in the Nasdaq crash. No specific news. 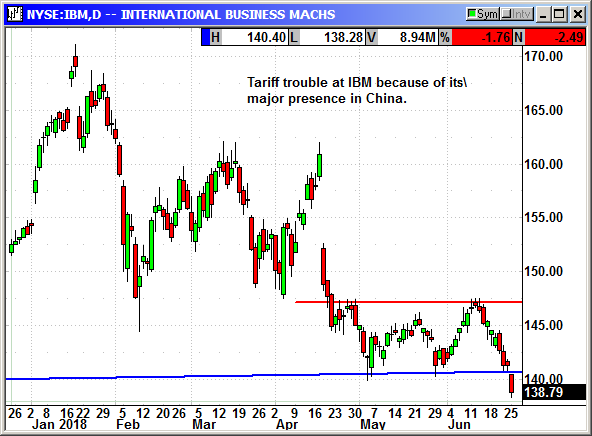 IBM got caught in the China tariff battle and finally broke long-term support today to stop us out. Original Trade Description: June 11th. Update 6/18: IBM announced the acquisition of Oniqua Holdings Pty Ltd, based in Denver. Financial terms were not disclosed. The 56 person company makes software to track maintenance and spare parts inventories in oil and gas operations, mining, utilities, transportation and similar industries. A study by the Aberdeen Group found that half of unscheduled downtimes was due to a lack of spare parts in inventory. IBM sees this acquisition as a way to bolster their IoT movement. Closed 6/25: Long August $150 call @ $3.13, exit .94, -2.19 loss. No specific news. Shares were rebounding again until today. Micron beat on earnings and posted higher guidance but investors sold it any way after one analyst said all the good news was priced into the stock. 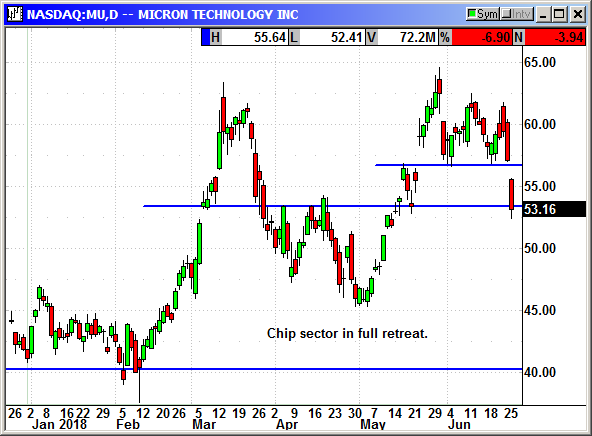 Add to that a chip sector in full decline and we were stopped for a big loss. Update 5/21: Micron raised Q2 guidance at the open from $2.76-$2.90 to $3.12-$3.15 and revenue rose from $7.2-$7.6 billion to $7.7-$7.8 billion. After the bell, the company said it was going to buy back $10 billion in stock or roughly 16% of the company at today's closing price. Shares are going higher. Closed 6/25: Long Aug $62.50 call @ $4.05, exit 1.28, -2.77 loss. No specific news. 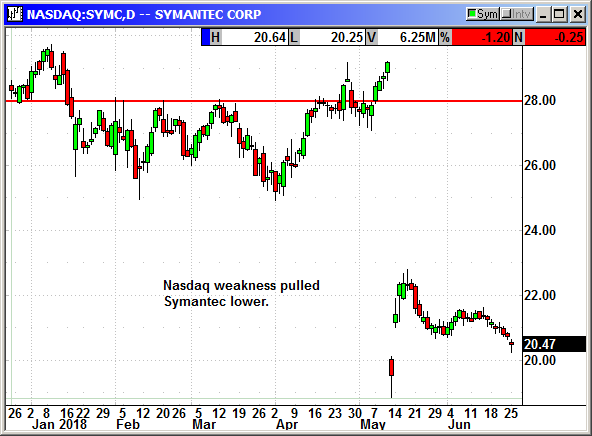 The rebound was fading and the Nasdag negativity since Thursday pulled Symantec shares down to hit our stop loss. Closed 6/25: Long Oct $24 call @ $1.62, exit .35, -1.27 loss. Closed 6/15: Long June $28 call @ $1.21, expired, -1.21 loss. The last several days has seen a 6 point spike in the VXX but we know it always moves lower eventually. This tariff tantrum will eventually become resolved or fall into the category of old news.